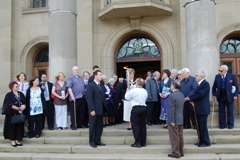 It started with the Torch being greeted officially by The Mayor of the City of Derby, Councillor Barbara Jackson, on the Council House Steps outside in front of the Historical Council House Building. 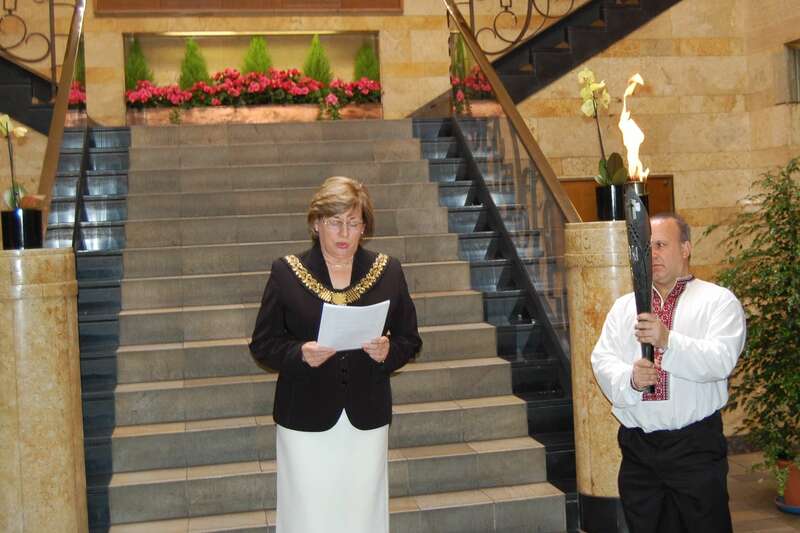 Joe Kupranec ((Branch Vice-Chairman) handed over the lit Remembrance Torch to The Mayor with Askold Lozynsky (AL) on one side and Vladyslav Rohoviy (VR) on the other. 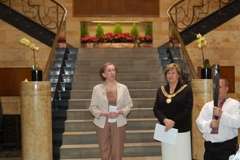 All the guests were then asked to enter the building into the Main Porch area to listen to the Mayor's speech who stood on the grand marble steps next to the lit Torch held throughout by Joe Kupranec (JK). In her speech she highlighted how proud the city of Derby was to be chosen as part of this week's Torch rally and underlined the importance of The Holodomor that we should never forget the 7million victims who suffered during 1932-33 Stalin's purge. She also drew some parallels with what is happening in some African countries such as Ethiopia & Zimbabwe. In response Vladyslav Rohoviy, the representative of the Embassy of Ukraine, read out a statement in English from the Ambassador. Councillor Ruth Skelton – Council Cabinet Member for Adult Services and Health - represented the Leader of Derby City Council, Councillor Hilary Jones who unfortunately was away on business. In her statement she also underlined how important it is to let the world know about these hushed up events. She is probably the exception because one of her best friends at school was a Ukrainian and her parents spoke to her about the horrific genocide events of 1932-33. The final speech was given to Rt. Hon. Margaret Beckett MP for Derby South (and former Foreign Secretary). In her speech she stated that over the years she has established a long standing relationship with the Ukrainian Community and was very proud to be present today. She reminded everyone that nothing is impossible going back many years when The Ukrainian Community was fighting for the Freedom & Independence of Ukraine and then not many of the elder members could believe this would happen in their life-time. She concluded saying that we must continue to let the World know about the atrocities that occurred in Ukraine during the years 1932-33 and should never forget the victims of The Holodomor. At his point everyone left the Council House Buildings for the short walk to The Cathedral for a short service. This took the form of a procession led by Cannon Nicholas Henshall of the Cathedral, Father Mykola Martynyuk the local Ukrainian Parish priest with The Mayor of Derby in the middle. The lit Remembrance Torch carried by JK with AL on one side and VR on the other. 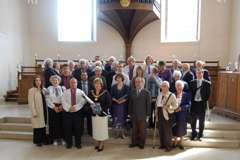 Approx 50 Members of The Ukrainian Community followed the Torch with other guests such as Margaret Siriol Colley (niece of Gareth Jones), Kirit Mistry Executive Director of Derby Racial Equality Council and other representatives from The Ethnic Minority Communities based in Derby. The procession followed The Holodomor Torch into the Retro Choir of the Cathedral and gathered round it. Canon Nicholas Henshall welcomed everyone to the Cathedral and was personally very proud to hold this important event here. Joe Kupranec then introduced the Liturgy by asking Father Mykola Martynyuk to say prayers from The Panachyda, commemorating the 7 million victims of the Holodomor genocide. Vladyslav Rohoviy then said a few words in Ukrainian followed by Askold Lozynsky President of the World Congress of Ukrainians who highlighted in his speech that nearly one third of the victims were children and quoted a letter from the Italian Ambassador in Kharkiv (the then Capital of Ukraine in 1933). Canon Nicholas Henshall (NH) then concluded the Commemorative Service by chanting out The Beatitudes, a Reading from the Revelation 21.1-6, a prayer of remembrance of the past and The Lord's Prayer. Canon NH then blessed the congregation and JK thanked everyone in his concluding words. Guests then had the opportunity to sign The Book of Remembrance held vigilantly by Martyn Chymera before a joint photograph was taken prior to the Torch leaving for Barnsley.